Whoah. Those are some pretty amazing monsters. They grow to the size of mountains; they live in an inhospitable desert where barely anything else can survive; they hunt via vibrations; they secrete mind- and body-altering drugs that change the shape of an entire universe. Whoah. 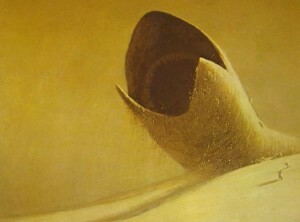 Nice monster, Frank Herbert! There’s a reason why Dune is one of the most beloved science fiction novels ever written. It’s a novel of incredible scope. It’s huge! Everything in that story is larger than life–the worldbuilding, the societies, the backstory. It’s intense. For example, the Bene Gesserit society in Dune has manipulated families for not just a few generations, but thousands of years, changing the politics of entire generations just to suit their breeding purposes. And then there are the Fremen, who have spend hundreds of years subjugating their instincts just to fight a battle against their ultimate enemy: the planet Dune. Think about it! These guys drink their own (ok, filtered) pee and poop moisture, render their dead for water, and find and drown baby sandworms just to green up their planet. Most folks would just move. All of that grandeur is amazing. It’s good work, and if that was all Herbert offered, his buddies would have patted him on the back and told him he’d created the best RPG setting of all time. That’s right: all the scheming, all the weird creatures, all the nastiness of the evil Baron Harkonnen, all of that stuff did not lift Dune up into the word-heaven where it lives. The epic awesomeness only works because it’s contrasted against the small-scale life of Paul Atreides. Paul’s not a normal guy, but he’d like to be. His dream is to be just like his dad, a decent, if really rich, dude. But everything goes wrong for Paul. He’s been bred to be a super-man. His dad is killed. He keeps stumbling into traps that will turn him into the Fremen’s prophesied hero. And all he wants to do is grow up and figure out who he is. So, to summarize, what makes Dune great is its judicious balance between the overpowering flavor vast worldbuilding and the hint of individual struggle. The small scale is the spice in this text. I can hear you jokers in the back complaining right now–it’s easy for Frank Herbert to pull of a balance of scales because the man was writing a 490-page novel! But balance of scope can rock a short story, too. A great example of a short story that uses scope in its favor is “The Taste of Starlight,” from the October 2010 issue of Lightspeed. Fully 97% of this story unfolds within the claustrophobic confines of a tiny spaceship, with one active character. It’s hard to get much more small scale than that. But what makes the story work is that the main character is the only person awake on the ship who has the knowledge that can save thousands of colonists on a distant space colony. Their plight hums along in the background of the piece, a connection to the larger world of humanity and morality. Without those colonists, while we read that story, we’d feel like we were locked in mad man’s mind, and we’d probably turn off the computer and go watch Glee or something. Balance of scope. It’s like cooking: salty and sweet playing off each other. Any time you’re working on a project and it feels a little flat, check out the size of the problems. Is everything gigantic? Is everything small scale? Is there any way to make your small scale problems connect with the larger world? Or put a small story alongside your world-changing issues? Aww! Thanks so much! That just made my whole day! Love this post. Another, although very different example that resonates with me is George R.R. Martin’s Song of Ice and Fire series. It is a huge epic struggle built up from many internal struggles, and you see these struggles through the eyes of each character who is living them.